As January flies past at warp speed and money flies out of my checking account at an alarming rate, I find myself digging into my wardrobe. What works? What doesn’t? Is this combination reaching or do I look as fantastic as I think? The fact is, I much preferred spending my extra hard-earned dough on presents for my loved ones. And because of this, Mix and Match Wardrobe is forcing me to be creative! I’ll be honest, at first glance, my reaction to the Lavender Lips and Roses Jenny skirt was: “meh”. Now don’t get me wrong. It’s lovely. I am a certified Jenny Addict, so I love the full silhouette and the lips and roses print. For whatever reason I just was not feeling this light purple offering, and so I passed on by. Until the opportunity to swap came up. 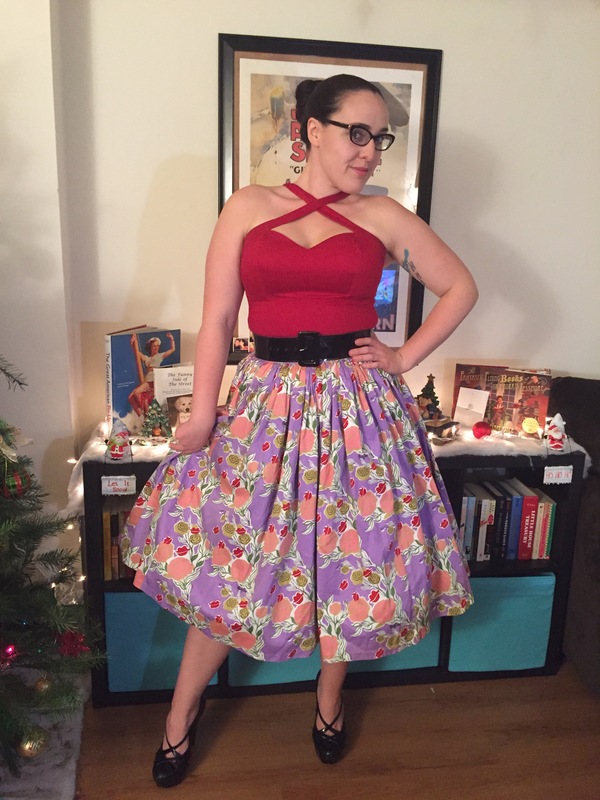 I was able to trade with a lovely lady from PUG Swap/Sell, thus bringing the Lavender Lips and Roses Jenny skirt home to me. Red is one of my absolute favorite colors to pair with this skirt. I love to pull out smaller featured colors and make them pop! 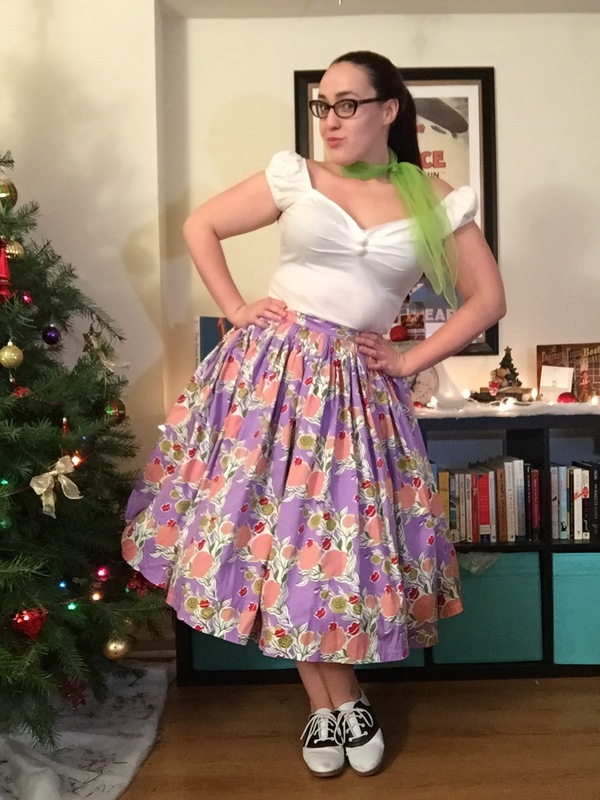 I find that Pinup Girl Clothing’s Voodoo Vixen top gives this combo a dressier feel. If I had been bothered to do my hair and makeup, this combination would lend itself well to this–the season of parties. This combination makes me feel very “Sandy” from Grease! I’m not sure if it’s the vintage lime colored scarf (pulling out those pops of green! ), or my all-time-favorite saddle shoes, but I’d have proudly worn this to Rydell High’s end-of-school carnival! I opted to go without a belt this time around, proving that with or without cinching, these skirts are fabulous at nipping you in at the waist and creating a lovely silhouette! 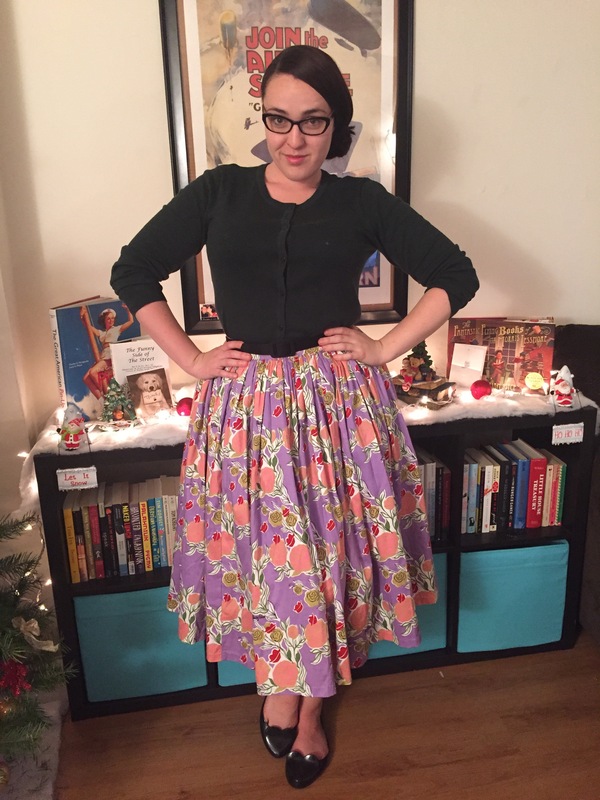 Oh, lavender Jenny skirt, I will never again doubt your beauty and versatility! As the chilly months draw nearer, I have found myself obsessed with creating cooler-weather combos for all of my lovely warm weather skirts. This print typically screams “Spring!”, but I’ve tucked in my handy dark green H&M cardi, slipped on a black belt, and violà! The chillier it gets, the more layers I’d put on, so as the temperature gauge drops I’ll add a pair of thick black tights to the mix. For now though, bare legs, and a simple pair of Mel by Melissa flats! Instead of my typical Malco petti, I’ve opted for my trusty Laura Byrnes Canvas Underskirt. This thing is perfect for everyday wear in that it gives you the volume of a fluffy skirt without all the bulk of a full-scale petticoat! Well, what are you lovelies waiting for? 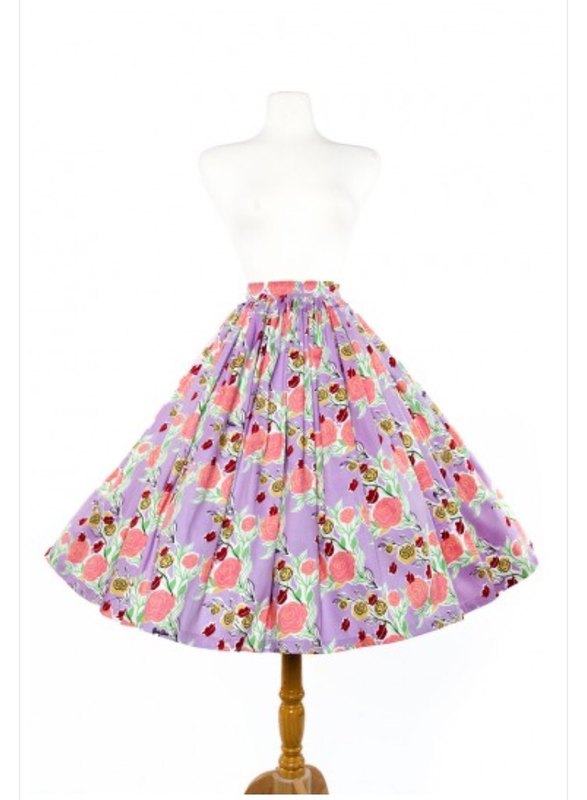 The Lavender Lips and Roses Jenny skirt was released as a limited run, so snap yours up while you still can! 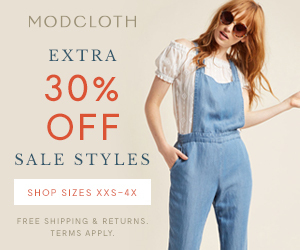 It’s still available in select sizes from Pinup Girl Clothing!